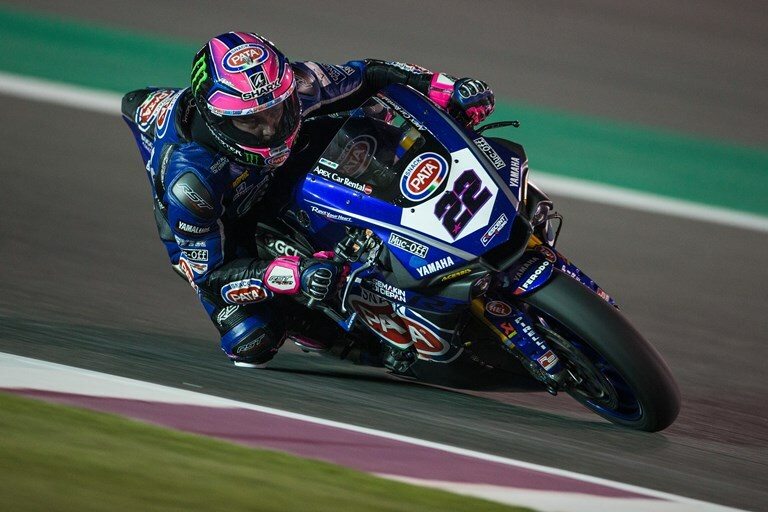 Pata Yamaha Official WorldSBK Team rider Alex Lowes got the final race weekend of the 2018 season off to a flying start today in Qatar, ending the day fourth on combined times after topping the timesheet in FP2. Michael van der Mark secured automatic entry into tomorrow’s Superpole 2 by finishing eighth today, despite having sat out most of the opening free practice session following a crash that he was lucky to walk away from uninjured. The first free practice session got underway as the sun set behind the main grandstand, with the riders heading out onto a track that was dusty and slippery through lack of use. Lowes quickly mastered the tricky conditions to finish sixth, but his Pata Yamaha teammate wasn’t so fortunate. Van der Mark lost the rear and highsided on the entry to turn one on only his second timed lap. The 25-year-old was lucky to walk away with minor bruising to his wrist and knee, but the bike was too badly damaged to allow him to return to the track before the session came to an end. While van der Mark played catch up during FP2, it was Lowes who set the pace. The Pata Yamaha rider was fast and consistent from the start of the session, which took place at the same time and in the same conditions as the races will be run on Friday and Saturday, building his pace throughout to eventually claim the top spot on the timesheet, which he held to the chequered flag. For the third and final practice this evening, Lowes and his crew focused on race set-up, running a 15-lap race simulation on rather than chasing a one-off fast lap. Despite problems with front tyre endurance on his long run, Lowes’ pace was quick enough to see him finish the opening day fourth on combined times and to secure automatic entry to Superpole 2 tomorrow. Having struggled to find a good feeling with his R1 in FP2, after losing most of the first practice to the crash, van der Mark and his crew made significant set-up changes for the third and final practice session, with positive results. The Pata Yamaha was immediately able to improve his lap time, eventually finishing in eighth position despite losing time to a mistake on his fastest lap.